Can Chef Style Diet Meals Really Make You Lose Weight? Have you ever felt deprived while on a diet? Chances are that this has happened to you. Enter Bistro MD. The Bistro MD diet was developed by Dr. Caroline Cederquist and her team of nutritionists and award-winning chefs to help people shed pounds while enjoying nutritious and perfectly balanced meals. Dr. Cederquist is a medical doctor who specializes in the field of weight management so she understands what it takes to lose weight and keep it off. There is a common notion that dieting involves a lot of sacrifice not only in the choices and types of food that you can eat but also in terms of taste as most people equate delicious food with food and ingredients that are fatty or unhealthy. Dieters who have come across Bistro MD (formerly known as Diet To Your Door) have always asked the perennial question of whether chef or restaurant style diet meals can really help them lose weight. Well, we are here to help you find out. For those of you who are fans of the hit NBC reality TV show The Biggest Loser, which features Jillian Michaels, this diet food delivery program was also the official meal plan provider for this show. Bistro MD was developed in order for dieters to enjoy partaking delicious, healthy meal plans with the end result of losing weight, improving their eating habits, and becoming healthy. The plan was also developed to help busy people from the hassle of preparing healthy meals for the whole family. Aside from the unique meals and healthy snacks, this weight loss diet program also includes a weekly information program that breaks down for you the science behind losing weight. The premise of the Bistro MD diet program is that dieting should not be equated to deprivation of eating fully cooked and delicious meals. By combining the science of nutrition with culinary cooking, one can lose weight as a result of having portion-controlled and perfectly-balanced delicious meals. Bistro MD designs meals with an average calorie count of 1,200 a day. They stress "average", because some of the meals can be above or below this average. The company reasons that it has been medically proven that if you stick to a strict intake of 1,200 calories a day, your body gets used to it making it harder and harder each week to lose weight. By varying — increasing or decreasing — the calories on a day-to-day basis, your body and metabolism does not get a chance to get used to a particular level, which in turn makes losing weight more effective. Below are some of the reasons why Bistro MD is increasingly becoming very popular among people who are trying to lose weight. Developed by a medical doctor who specializes in weight loss management. This diet plan was developed by Dr. Cederquist to initially help her patients lose weight. Dr. Cederquist is board certified in family medicine and bariatrics, the specialty of medical weight loss. Dr. Cederquist's meals were initially developed to satisfy the discriminating tastes of her Naples clientele. In no time, the meals became so popular by word of mouth. Today, Dr. Cederquist's meals are marketed as Bistro MD and is increasingly becoming one of the most popular home delivered diet meals in the country. Actual testimonials of people who have lost weight. You will find a lot of client testimonials about how this diet program has helped a lot of people right on the company's website. We also did some further research and found postings and testimonials of people on forums on how they have successfully achieved weight loss with Bistro MD. 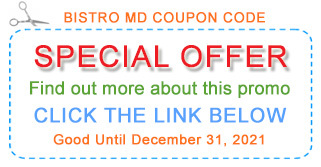 Note: This exclusive coupon code offer is not available elsewhere and only works with the link above. People who have lost weight with this diet food delivery program attest to the fact that the pre-planned meal plans are so convenient to have and a marked improvement over the type of unhealthy meals that they are used to. Furthermore, they attest to the satisfaction that they are eating full meals without feeling deprived of the the enjoyment they get from eating delicious restaurant or home-cooked meals. Even your families will enjoy the meals. For the fraction of dining out at a good restaurant, you can have great tasting food with the added benefit of being healthy and nutritionally complete. Deliciously tasty. We normally try to avoid to providing commentary on the taste of diet food because taste, as we all know, is a matter of personal preference. In the case of Bistro MD, we just can't help but say something about how these diet meals taste. The meals are superbly delicious. These are really well-thought of and prepared. After trying other diet meals, from pre-packaged diet food or supplements that you mix with water to those being sold by the major weight loss programs, Bistro MD menus are a welcome treat. It is no wonder that those who have gone through this weight loss diet program prefer to stick with this until they achieve their weight loss goals. Simple and easy to follow. One of the main goals of this diet program is to take out the hassle of meal planning and preparation. You simply follow the scheduled meal plan, unpack and heat the food, then eat. It does not get any simpler than that. Well-balanced, pre-portioned meals. Bistro MD meal plans are based on lean protein, complex carbohydrate, and low fat. Lean protein has been proven to keep you feeling full and maintain your blood sugars. Simple sugars found in pasta, potatoes, and white bread are not part of the meals since these are known to spike and drop your blood sugar rapidly, causing you to feel hungry soon after eating. Furthermore, these meals are portion-controlled, which is important to change your eating habits and induce weight loss. Various meal plan options. This diet food delivery program has various meal plan options for you to choose from. Currently, there are four options: full week (7 days) with snacks, full week (7 days) without snacks, work week (5 days) with snacks, and work week (5 days) without snacks. These are restaurant quality food and the menus are rotated weekly so that you have some variety. If you have any food restrictions due to food allergies or religious preference, Bistro MD also has an extensive substitution list for you to choose from. Shipped in insulated coolers with dry ice directly to your door. The program ships a week's worth of meals via Fed-Ex within one week of your order directly to your door. All orders are shipped in insulated coolers with enough dry ice to guarantee its freshness upon delivery. Of course, these meals are freshly cooked by Bistro MD's chefs, then vacuum-sealed to seal in the freshness and nutrients of the food. Very convenient. Bistro MD was designed with busy people in mind. All you have to do is follow the meal plan accordingly. There is no need for you to plan or prepare your meals since your meals are already pre-cooked. This is a big-time saver for the busy person who is also trying to eat healthy to lose weight. Free diet profile. Before you start on this weight loss diet program, you can get a free diet profile right on the website to evaluate your situation and help you prepare your diet program. By personalizing your plan, Bistro MD can help you achieve your weight loss goals much faster and more effectively. Also designed for diabetics. At the Cederquist Medical Wellness Center, Dr. Cederquist sees dozens of patients everyday who have been diagnosed as diabetic or pre-diabetic. The diet program was designed also with diabetics in mind so the program works perfectly well also for those who have been diagnosed as diabetic. Endorsed by Jillian Michaels. Fitness guru and trainer Jillian Michaels, best known for her stint on the popular reality weight loss show The Biggest Loser, highly recommends this diet paln to overweight people who are trying to transition themselves from their unhealthy eating habits. Jillian Michaels has a series called "Wake Up With Jillian" on The Doctors show. In this show, Jillian helps overweight people get back in shape through exercise and eating the right kinds of meals like Bistro MD. Endorsed by The Doctors. The increasingly popular TV show The Doctors has partnered with Bistro MD (see video above) to provide food to people who the TV show is trying to help lose weight. For those who are still not familiar with The Doctors, the show provides frank discussions of common health topics and valuable information from renowned physicians. Endorsed by Dr. Phil. If it is worth anything to you at all, Dr. Phil highly endorses this weight loss diet program. In one of the video clips, you can watch Dr. Phil give some advice and recommend Bistro MD to a 400+ pound man who has committed to losing weight. Dr. Cederquist can also be seen in the clip. Pre-cooked food not appealing to some people. If eating pre-cooked and pre-packaged food does not appeal to you even if this was designed for you to lose weight and prepared and packaged with the latest food technology to preserve the freshness and nutrition-value of food, then Bistro MD is not the weight loss diet program for you. Pre-made menus. Although the main purpose of pre-made menus is to make selection as convenient as possible for its customers, there are those who prefer to have flexible menus. So this is a matter of personal choice on whether you prefer that someone creates the menu for you or not. For those who prefer more flexibility, then the Bistro MD diet meal delivery service might not be for you. Could be a bit pricey but ... Some people who went through the Bistro MD diet program initially thought it to be a bit pricey BUT ... after some further analysis ... found it quite reasonable. Here's why: depending on the meal plan that you decide to get, your average cost per meal for a week's package can range from $6.06 to $7.99. Compare this to buying a meal from a restaurant, from your supermarket deli, or a fast food joint, this comes out to be about the same cost or in some instances ... still cheaper and reasonable — considering that you are eating a well-balanced and nutritious meal that is designed to help you lose weight. No face-to-face or online support group. Some people like to have face-to-face meetings with a support group or a weight loss counselor to keep themselves motivated. Unlike Jenny Craig or Nutrisystem, Bistro MD does not offer this. This diet program also does not have an online community that you can join. If you are the type of person who needs a support group or a counselor, and you would like to go with this program, try to find people who are using the Bistro MD diet program in your community or city. Is the menu too "classy" or "exotic" for your taste? There are always those who might find certain cuisine "too classy" or "too exotic" for their taste. If you fancy yourself to be a plain Jane or no frills John type of person who does not want to try well thought out restaurant type, healthy cooking, then we are afraid that Bistro MD might not be the right type of diet meal delivery service for you. Now if you want to explore and try some restaurant-type of cooking that can help you lose weight, then this diet program is the answer. If you prefer regular or home-cooked type of dishes, you might find dishes more to your liking at Diet to Go (Editor's Choice). Available only in the US. Unfortunately, for those who live outside the United States, Bistro MD does not deliver outside the United States. Who knows, the company might expand in the future. For now, this diet food delivery program is only available in the United States. If you have become tired and bored with the diet that you are currently doing or if you want to mix up your diet program a bit for variety, you might like to give Bistro MD a try. Some of the dieters that we have come across or have talked with have used this diet food delivery program to add some spice to what they have called their "boring", "zestless" and "taste-deprived" diets. Our top choice for chef style, pre-cooked meals delivered right to your home. In some cases, there were dieters who, after going through the "Bistro MD experience", decided to stick with it until they reached their weight loss goals. Some dieters also used this diet food plan in the maintenance phase of other diet programs that they were following to include variety. Another positive aspect cited by Bistro MD users is that they say that they have saved a lot of time in their meal preparation — making this perfect for the busy person. Most importantly, those who have lost weight through this diet program swear that this diet plan is really a delicious way to effectively lose weight. Now that you know the pros and cons of the Bistro MD diet program, the choice is now up to you. Visitors interested in Bistro MD have also considered Diet to Go, Mediterranean Diet, and Medifast. "Did We Lose Weight with Bistro MD?" We searched the web and found the following feedback on the Bistro MD diet. 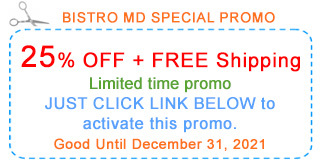 Note: Most Bistro MD users have reported losing one to two pounds on average per week. Please be aware that results may vary depending on the individual and other factors. "I gained a tremendous amount of weight from an automobile accident and benign nodules all over my thyroid. I have just about given up and then I read about BistroMD online and decided that their program made more sense than anything else out there. To date I have lost 25lbs and 20 points off of my cholesterol. 15lbs were lost during the worst time of the year – the holidays. I never in a million years thought that could happen but it did! I am getting ready to tackle the second 25lbs and know that I will be successful as this program works! ..."
"First of all, customer service was outstanding. They were able to answer my questions and assured me that it would be easy to cancel out the program if I didn’t like it ... When the food arrived, I was impressed. It looked like everything was prepared in a gourmet kitchen and simply vacuumed sealed and frozen. Not to mention that it all looked great. Turns out: THEY WERE GREAT! The food is absolutely delicious. Within 2 days the swelling of my feet vanished. By the end of the first week, I was down 10 pounds. 10 pounds! Talk about motivation to stick with the program! It’s now been 5 weeks and I’m down 25 pounds! 25 pounds!! The program is so easy. It completely takes the hassle of counting calories and worrying over portion sizes completely off the table. I still have a long way to go but I have no doubt that with Bistro MD as my partner in my weight loss journey, I will finally reach my goal ..."
"I have mixed feelings about the breakfasts, but they are growing on me. They taste good but some seem to be very similar to items that could easily be purchased at the supermarket. For example, frozen waffles with sugar-free syrup. There is one breakfast that is super-fantastic however – phyllo dough pastries with fruit filling. WOW ARE THEY GOOD, and you get two for only 220 calories. I will be spending some time at the supermarket to really see if I can get quality 'substitutes' for the breakfasts (with as much protein and fiber) before I make a decision whether or not I'll continue to order the breakfasts. I may keep ordering the breakfasts just for those pastries!" "Bistro MD has a lot of variety in food. I am only on my second week but the convenience is just amazing, I LOVE being able to to put something in the microwave and walk away and having breakfast, lunch or dinner ready in a couple minutes... no more shopping for ingredients, no more waiting in traffic. The food itself is fantastic, it is truly restaurant quality. My favorite so far has to be the crepes for breakfast and the meatloaves for lunch. The snacks are excellent as well, i happen to like jerky, so when i found the 50 calorie very low sodium jerky in my box, it was an awesome day... I highly suggest it for anyone, it is definitely not hospital food, and the portions are HUGE compared with lean cuisine, yet still the same calories... I dont know how they do it, but i'm loving it..."
"Bistro MD is the BEST choice you can make if you're just starting out on your journey. GREAT tasting food! Bottom line: I had to quit kidding myself. I was TOO BUSY to do it one my own. I need 'someone else' to keep track of the calories for me. But Bistro MD does more than that. ..."
"I am very pleased with the product and the service. If anyone would have told me that I could eat gourmet food AND lose weight I would not have believed them. The food is incredible, the service has been great, and after week 1 I can say I am under 200 pounds for the first time in 5 years. Awesome! So excited to continue and enjoy the food and weight loss. I can't believe that the food is actual food and it is so yummy I am never feeling like I am missing something." "I'm on Week 18 of Bistro MD ... So, I'm a big fan, obviously. I love the taste of the food. I love the variety I have (even though I only get 30% of the Bistro MD food options, due to my wheat issues). And I'm pleased with how easy it is and I know I'll be in a MUCH better place a year from now ... and that's a huge deal for me. ..."
"I have lost 60 pounds and have 25 to go to get to my goal weight. I was 230 pounds and want to get to 140. Without the help of your program, I could never have lost this weight! " "... I did not like Bistro MD very much, although they had some nice low-cal bagels and tasty muffins and pastries ... They also have a decent high-protein hot cocoa. But the meals....eh. I don't want to eat chicken THAT much, and especially pre-cooked chicken ..."
"... Since March 1, 2008, I have lost 65 pounds. On March 1, 2008, I weighed 235 pounds. Today I weigh 170. I went from a size 42 waist to size 32-33. I went from a size XL shirt to a medium, and can even wear the “athletic” fit styles. My jacket size is currently 42S…down from a 48R. (I needed the length to cover the tummy) I look 15 years younger and feel 20 years younger. When you’re 57, that’s a huge impact on your appearance and feeling of well being. I’m in the entertainment industry and all of my clients and colleagues are constantly commenting how great I look. “How did you do it?” they all ask. I share the BistroMD story with them and anyone who will listen. Thanks for being the catalyst that got me started to a new way of life. " "... It's way better than nutrisystem, and is actually the lunches and dinners are very good better than i might cook for myself ..."
"I think its best not to use diet pills as they can be harmful in the long run. Since you are already working out, I would suggest watching your diet. Counting calories can be a hassle and a waste of time. You can try using diet food. I used Bistro MD diet meals for about 5 months and lost a good amount weight with it. Bistro MD is low calorie food prepared by experts and they used to deliver it to my door and it surprisingly tasted good." "... I recommend Bistro MD, just because the appetizing pre-made meals are something that not many other diets have to offer ... You get what you pay for, or so they say, and frankly your body, health, and happiness are worth every penny." "... Then I tried Nutri-System, and OH MY was that terrible!!! Sent it back and requested a refund. I had almost given up when I ran across BistroMD. I was not familiar with BistroMD, so I read the testimonials and I had a hard time believing them. Unfortunately, you can’t believe everything you read. But I stand hear today to say BELIEVE IT! BistroMD Meals are delicious. I am steadily loosing weight pound by pound. I look forward meals. There have been meals that when I read the menu I was like uh oh, this is going to be the one, the one I won’t like….. but wrong, I’ve eaten every meal and don’t regret a one. Give it a try. Especially if you are a mom who never does anything for yourself. It is worth it! And it’s fun to tell the kids NO you can’t have a bite and yes I know it smells great "
"... I do like the food a LOT more than I expected, and I'm a pretty picky eater. The only thing I just couldn't bring myself to eat after I heated it was some fish (blackened tilapia). I ate the veggies and tossed the fish. Everything else has been pretty good. It's easy for me, especially for dinners and weekend meals, since I don't cook anyway ..."
"I went from a size 26 to a 16 in 2 months. I could hardly walk - - now I am jogging. Last weekend I went shopping in a regular size-clothing store for the first time in years!" "After 5 years of marriage, my husband and I were shocked to find that we’d both become overweight. Due to busy work schedules cooking was hard, so we decided to try BistroMD. After 4 months on the program, he lost 35 pounds and I lost 15. We both still have a bit left to go, but feel amazingly better and super motivated. Best of all, being on the plan has taught us how to eat healthily. The program has been a great catalyst for a healthier lifestyle for both of us." "... I hated nutrisystem and jenny craig. their food was just horrible. their food is nothing compared to bistro md's gourmet food. with bistro md, you simply enjoy the food while losing weight." "I am on my second week of BistroMD. I,too, am single and figured it cost as much as going out to eat all the time ..."
"... I see a huge difference in how my clothes are fitting, how I am feeling and my capacity to do just normal living breathing types of things, that have been severely limited for several years now. UPDATE … I had labwork and then in for a doctor’s appt last week … after 11 1/2 weeks on BistroMD, I lost 43 pounds. My A1C dropped from 8.0 to a wonderful 6.3, and my cholesterol dropped from 251 to 191. GREAT results! Thanks again!!!" "... I'm on week four of the BistroMD program and have been extremely pleased with it. I am doing the full 7 day program with snacks and some small substitutions since I am allergic to aspartame and cinnamon. So far, I have lost 6 pounds in 3 1/2 weeks, which is pretty great considering that I haven't really been exercising and that I'm in normal BMI territory. The food has been extremely satisfying. The meals and flavors are very diverse, and I have never once felt hungry or deviated from the program. I have made good use of my "off night" once a week and binged a bit on the things that the diet deprives me of (mostly bread, chocolate, and cheese), but then I'm able to go right back into the program ..."
"Long story short, Tom has lost 38 pounds, was able to get off insulin and is feeling great. He is eating more calories than before -- but the right calories. He has 8 more pounds to his goal. Tom is a lovable 38-year old young man, and when food intake is properly managed, he is free to enjoy life. Bistro MD has been a blessing to all of us ..."
"... And from what I've read, there is NO home delivery service out there that is 100% problem-free, in this area. ALL of them have delivery mistakes, billing mistakes, shipment contents mistakes, you name it! So, for me, the fact that Bistro MD has made *every mistake RIGHT* and *very promptly* is enough to keep me happy. Because it looks to me like NONE of them are mistake-free companies ..."
"I have a thyroid problem that was diagnosed several years ago. I gained 10 pounds (from 130 to 140) before being diagnosed. I gained another 10 pounds even after being on the correct thyroid medicine. My endocrinologist would say “stay away from the carbs” when I would complain about my weight gain. I just did not have the will power. By joining BristroMD (8 weeks ago), I have had a steady weight loss. In 8 weeks, I have gone from 150 pounds to 136 pounds. I feel confident that I will reach my goal of 130 pounds. Thanks for BistroMD!!!!" "... I started Weight Watchers and Jenny Craig a few times each but just couldn’t stick to it. Although I had lost weight in WW in the past, I just didn’t really like the points system since it gave me too much leeway. I have lost 5 lbs in my first 2 1/2 weeks on BistroMD. The food is great, very fresh, gourmet and a good variety. I don’t find that I am craving sweets at all like I used to and because of all the protein and the generous sized portions, I feel very satisfied after I eat. I know this is a diet I can stick to and will continue to lose the weight. I have some favorites that I really look forward to.."
"... The low-carb doughnuts, muffins, etc. have a very artificial taste, but the lunches and dinners are quite good. I can't stand fish, so I made substitutes for that. The only other dinners I substituted were the veggie burger (don't like them at all) and the beef marsala (I think that's it; it was a newer item). It was very easy to substitute & I liked everything else ..."
"... overall, Bistro MD is so convenient and the gourmet food is just incredibly tasty. I've gotten my friends on this too ..."
"... I have always said if someone could cook for me I wouldn’t have any problems staying on track! Lo and behold I am well on my way to my long term goal of 100 pounds and already hit my short term goal of 20 pounds in 6 weeks!! A Vera Bradley backpack will be my personal reward. The food is 90% awesome there are occasional meals I don’t care for but then I request them not to be shipped in the future. The food is varied, tasty, easy to prepare, and is the epitome of luxury enabling me to readily stick to the diet and REALLY learn healthy life choices along the way. I plan to be with Bistro MD for a long time. Keep up the good work in helping to continue to improve my health to a better state before all this cancer and side effects over took my body." "The meals are huge!! Tasted great - - and I couldn’t believe it was only 260 calories. I gave my husband Lean Cuisine at 290 — ½ the size — he was not happy! " Are you on or have you been on the Bistro MD? Tell us about your experience.